Desktop Ergonomics is all about with maintaining right posture while working on your desk computer. Long periods of typing on your keyboard, improper workstation setup, lighting , and incorrect posture can lead to wrist injuries, back problems which can often lead to aggravated conditions. How Can Ergonomics Help Me? Whether you are a student or an adult, whether you are using your computer at home or at workplace, making some small choices about the way you sit, type, use your mouse can go a long way. Making yourself comfortable and relaxed, especially when working long hours is important. Using the principles of ergonomics, you can help ensure your own safety. 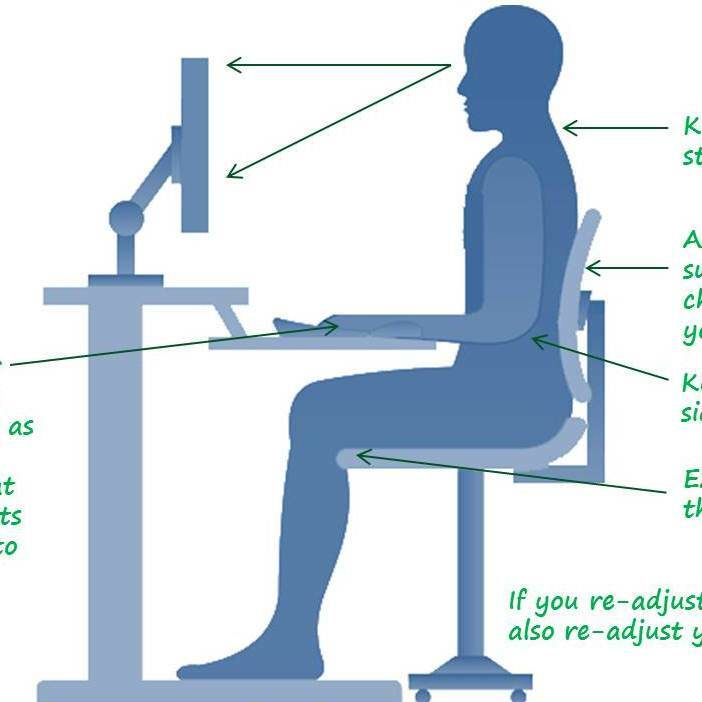 Following infographic provides some quick tips on ergonomics you can start using immediately to correct your posture while using your desktop computer. Your monitor screen should be approximately at an arm’s distance (16 – 29 inches) from your eyes. Adjust your screen height such that the top-line on your screen is at your eye level. Head and body should be kept straight with your shoulders relaxed. Height of your chair should be such that your feet can be kept flat on the floor or on a footrest. When you adjust your chair’s height, also make sure you re-adjust your monitor screen orientation. The curve of your back should touch the curve of your chair’s backrest. You should adjust the backrest accordingly. Also, exert only moderate pressure at the end of the seat cushion. Your elbows should be close to your body, by your sides. Keep your wrists straight and flat on the desk. Your hands, wrists and forearm should be parallel to the floor. Cover the mouse with your palm and fingers holding it lightly. Click as gently as possible. 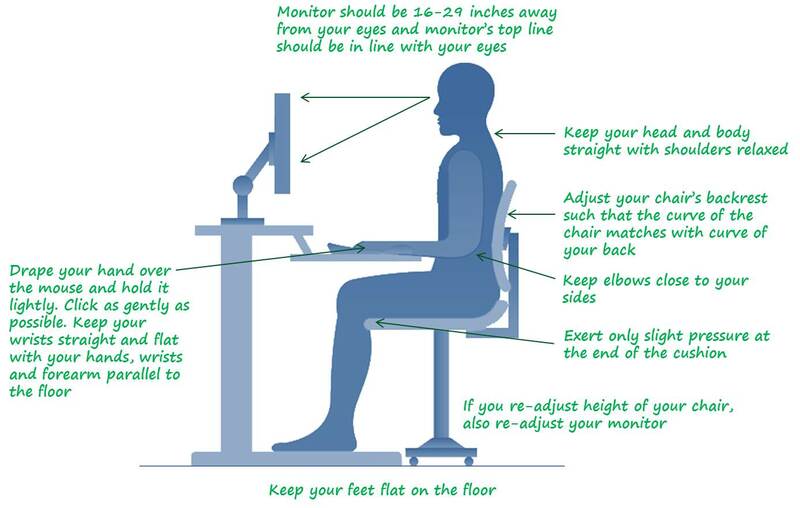 Following these simple tips on ergonomics while using your computer will help you ensure better health and safety at work and at home. – Maintain a Good Posture – Infographic” with my best close friends on facebook. I reallyonly wanted to spread ur outstanding posting! Hi, great infographics on the topic! An office is known to be safe and healthy for the employees if it is ergonomically equipped. I have as well started a community site on the same: http://bit.ly/ergo_blog which talks about the ergonomics and its applications & importance to the modern day workforce!